During service on equipment, the most important damages (inverter, motor boards, motors) often depend on a lack of customers (gyms or home users) in the maintenance/lubrication of the treadmill. In particular they use unfit products (such as WD 40 lube) or they forget the lubrication of the belt/deck. wax is recommended by some manufacturers of professional equipment and even used in some models with a kind of wax pump system (Life Fitness equipment). It is suitable, but it leaves many residues, thus damaging the deck over time. The purpose of lubrication is to reduce the friction between the board and belt so what must be lubricated is the board and the belt is oiled as a result. You should avoid having large amounts of lubricant on the rollers, because rollers and belt should make a good grip with no need of much tension. Between domestic and professional equipment there is a noticeable difference, commercial treadmills can lubricate with a greater abundance of lubricant. Home use treadmill should be lubed frequently but with a small amount of lube. 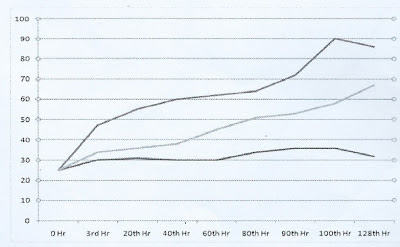 Proper lubrication reduces power consumption (by 25/30%). In some cases the lubrication doesn’t get any effect. This happens when the belt is too old: to avoid expensive damage to the machine you should replace the belt when it’s worn or old (more than 5/6 years). 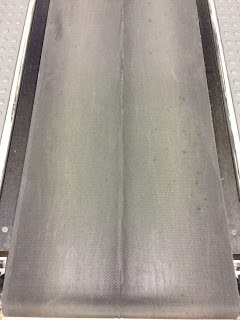 This test was performed by mounting a load of 150 kg on a new belt, and sliding back and forth on a new treadmill deck. The lower temperature level is with the silicone lubricant “silic one”. The middle tier with a silicone lubricant purchased in hardware shop, the highest level it with wax. Around 90° C the belt begins to suffer because the filaments that make up the canvas of lower texture start melting. This is a test with person of about 75 kg on the real treadmill. In this case, you notice much less the difference between the two types of silicone lubricant. The temperature of the wax still moves away from silicone type lubricants. We see in these picture a classic example of belt damage due to overheating, the canvas (bottom side) in the center melted to form a wrinkle on the belt in the middle (top). 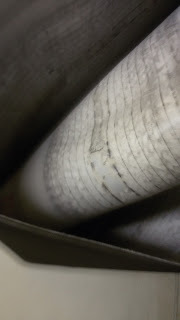 This behaviour usually occurs when the belt reaches a temperature close to 100° C. Excessive belt tension (too tighten) and imperfections of the board (dips, deposits of debris) can accelerate this degeneration of the belt. 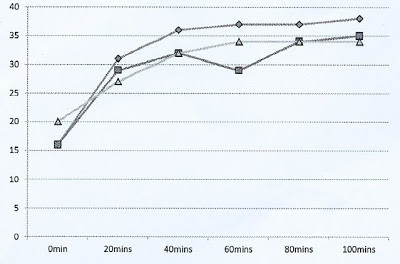 Depending on the age of the belt material (older = harder) and the type of fibre/fabric used (PVC, PET, TPU), belt may resist better to high temperature. This is anyway not a good news, because failure may happen on other components of the unit, which are usually far more expensive, such as the inverter.